B Condensed Consolidated Interim Financial Statements 49 Consolidated Balance Sheets 50 Consolidated Income Statements 51 Consolidated Statements of Comprehensive Income 52 Consolidated Statements of Changes in Equity 53 Consolidated Statements of Cash Flows 55 Notes Interim Report Third Quarter and First Nine Months of 2014 Allianz Group 57 The following table summarizes the recognized amounts of assets acquired and liabilities assumed related to the Distribution Activi- ties: Property-Casualty insurance Business of UnipolSai Assicurazioni S.p.A. – IDENTIFIABLE ASSETS AND LIABILITIES € mn Fair value Deferred tax assets 4 Other assets 28 Intangible assets 113 Other liabilities (27) Total net identifiable assets 118 Intangible assets consist of the customer relationships related to the acquired agency network. Other assets acquired of € 28 mn include mainly receivables from agents. The fair value of the assumed other liabilities of € 27 mn is provi- sional due to the pending receipt of the final valuations of those lia- bilities. Other liabilities comprise mainly payables to agents and employees. The aggregate consideration for the acquired Property-Casualty insurance business of UnipolSai Assicurazioni S.p.A. amounts to a maximum of € 440 mn. It includes: −− a payment of € 200 mn processed on 30 June 2014; plus −− a contingent consideration, calculated as a percentage of the premiums attributable to policies renewed and transferred dur- ing a specified period following the acquisition date. The future payment that the ­Allianz Group will be required to make under the contingent consideration arrangement is up to € 240 mn and expected to be made in the first quarter of 2015. An overall amount of € 375 mn (consisting of € 200 mn initial payment plus € 175 mn best estimate of additional contingent consideration as of 1 July 2014) has been allocated to the Distribution Activities leading to the determination of goodwill as follows: Property-Casualty insurance business of UnipolSai Assicurazioni S.p.A. – Determination of goodwill € mn Fair value Consideration in cash 200 Contingent consideration 175 Total consideration 375 Total net identifiable assets 118 Goodwill 257 The fair value of the contingent consideration of € 175 mn attributed to the acquired Distribution Activities is primarily based on informa- tion regarding expected churn rates of customers of the acquired business and expected renewal rates of existing policies available at the acquisition date. Acquisition-related costs in the amount of € 8 mn (including € 6 mn registration taxes and € 2 mn legal and consulting fees) are included in administrative expenses. Goodwill of € 257 mn arising from the acquisition consists largely of synergies, new business and cross-selling opportunities expected to be generated from the acquired network of agencies and is expected to be deductible for income tax purposes. The impact of the acquired Property-Casualty insurance busi- ness of UnipolSai Assicurazioni S.p.A. on the ­Allianz Group’s total revenues and net income since the acquisition was € 85 mn and € (21) mn, respectively. 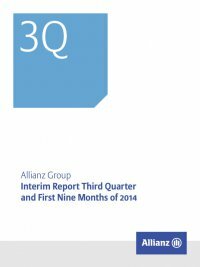 It is impracticable to provide consistent infor- mation about the gross premiums written, total revenues and net income of the combined entity (Allianz Group including the acquired Property-Casualty insurance business of UnipolSai Assicurazioni S.p.A.) for the nine months ended 30 September 2014 because the ­Allianz Group did not have access to the UnipolSai database and sys- tems for periods before 1 July 2014. At the time the ­Allianz Group expects to acquire the Portfolio, the ­Allianz Group will recognize additional assets (mainly cash and cash equivalents and receivables from policyholders) and liabilities (mainly unearned premiums and payables to agents). The acquisi- tion of the Portfolio is expected to lead to the recognition of a small separate intangible asset equal to the present value of future profits inherent in the liabilities of the Portfolio to be assumed.